Whenever modularity gets tricky, OT/J provides just one more dimension for your architecture. With OT/J there's no excuse for any architectural workarounds. With OT/J any existing piece of Java code is reusable. Existing components can be adapted to specific needs in full adherence to your projects requirements and without compromising a crisp modular architecture. OT/J looks back on a long history, but is is also well integrated with Java 8, and sports a leading-edge mechanisms for runtime specialization. The Object Teams Development Tooling (OTDT) supports development with OT/J at the same level of convenience and productivity as the JDT does for Java: the OTDT is an extended and adapted version of the JDT. 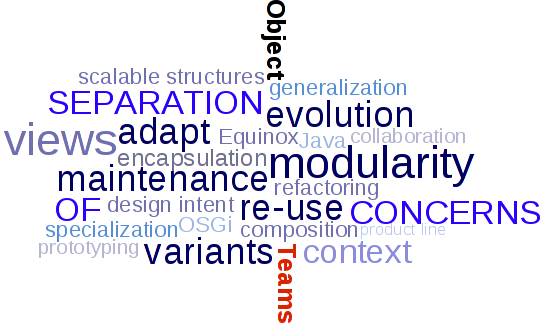 With OT/Equinox the advantages of Object Teams can be applied in any Plug-in/OSGi setting. The Object Teams project provides just the right tooling and runtime for applying OT/J in various contexts, enabling superior productivity. Version 2.5.3 of Object Teams has been released! See the list of bugs fixed since 2.5.0. Version 2.5 of Object Teams has been released! In this release the new runtime weaver, which is also capable of Java 8, has matured for productive use. Session: Runtime Specialization - Java has never been so dynamic before provided a fresh overview of Object Teams and included a first public demo of runtime weaving. Version 2.4 of Object Teams has been released! As a consolidation release this version has no significant new features. Version 2.3 of Object Teams has been released! It integrates Java 8 and features a runtime weaver. See what's new. The final release 2.2 has been published as part of the Kepler release train. Confined Roles and Decapsulation in Object Teams — Contradiction or Synergy? – published by Springer. The service realese 2.1.2 has been published as part of Juno SR2. The service realese 2.1.1 has been published as part of Juno SR1. The final realese 2.1 has been published as part of Juno. A talk on Object Teams has been accepted for JavaOne 2012. New: Slides and recording are available. Project lead Stephan Herrmann has been recognized as 2012's Top Contributor. EclipseCon Session: How to train the JDT dragon (with Ayushman Jain) included a section on using OT for adapting the JDT. The service release 2.0.2 has been published as part of Indigo SR2. The milestone release 2.1M4 includes the support for null annotations that has just been added to the JDT. The service release 2.0.1 is the first official release bringing Java 7 support to OT/J. Session: Bye, bye, NPE included a show case of using OT/J for building a variant without the burdens of patches nor branches. The twin milestones 2.0.1RC1 / 2.1M1 have been published bringing Java 7 support to OT/J. The release 2.0.0 has been published on time as part of the Indigo Simultaneous Release. Service release 0.7.2 (for Eclipse 3.6.2) is available for download. 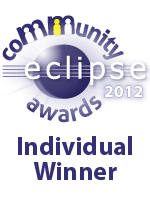 The tutorial "Hands-on introduction to Object Teams" has been accepted for EclipseCon 2011. The German Eclipse Magazin has printed an article on Object Teams in its issue 3.10 - Online version. • Archived proposal • Docuware.